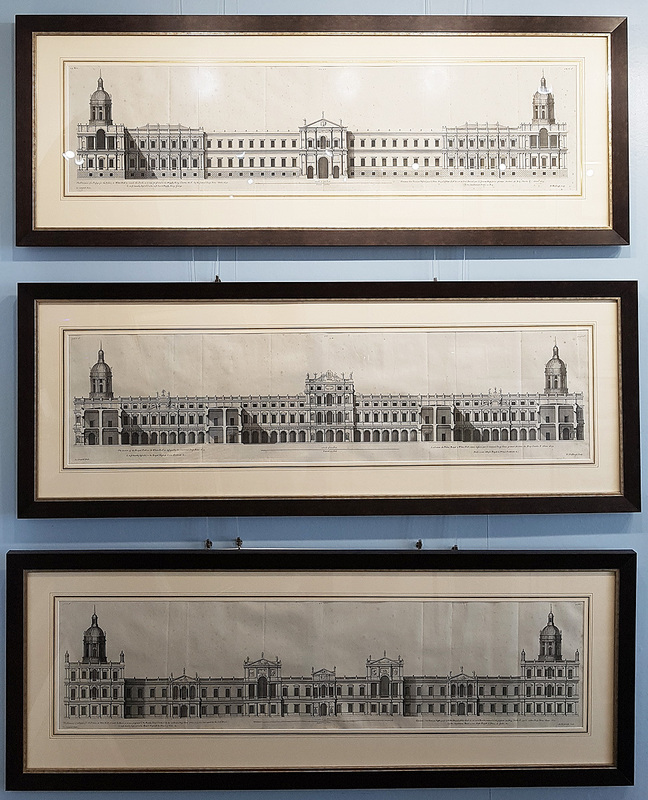 Description: These three extensive images represent Inigo Jones design for the Palace of Whitehall in 1639. They were published by the Architect Colen Campbell in his landmark Vitruvius Britannicus. The engraving was performed by Henry (Henrick) Hulsbergh between 1715 and 1717. Would look stunning on an office or study wall! Condition: Good bold imprints, original fold and printing marks, beautifully mounted and framed. Some light 'foxing'. 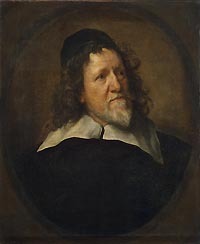 Inigo Jones (1573 - 1652) is regarded as the first significant British architect. Beyond the fact that he was born in the vicinity of Smithfield in central London the son of a Welsh Catholic cloth-worker, little is known about Jones' early years. Towards the end of the 16th century he became one of the first Englishmen to study architecture in Italy, making two visits to that country. The first c.1598-1603 was possibly funded by Roger Manners, 5th Earl of Rutland. The second, from 1613 to 1614, found Inigo accompanied by the Earl of Arundel. His work then became particularly influenced by the highly original and much imitated Italian architect Andrea Palladio 1508-1580 & to a lesser extent, he also held that the setting out of buildings should be guided by principles first described by ancient Roman writer Vitruvius. In 1615 Jones took the post of Surveyor General of royal buildings to King Charles I - who was deposed and executed by Oliver Cromwell (1600-1649) - Jones career effectively ended with the outbreak of the Civil war. He was also a splendid painter and theatre artist. Jones' best known buildings are the Queen's House Greenwich, London started in 1616, his earliest surviving work Banqueting House at Whitehall (1619) - part of a major modernisation by him of the Palace of Whitehall - which also has a ceiling painted by the Prolific Flemish baroque painter Peter Paul Rubens. He was knighted by the English king Charles I (1577-1640) . Colen Campbell (1676-1729) born in Nairnshire, Scotland, initially he trained to be a lawyer who subsequently took up architecture. Vitruvius Britannicus was the first English architectural publication since Elizabethan times, & catalogued the work of great architects of the time, including Indigo Jones and Sir Christopher Wren, as well as Campbell himself.It was a time when Britain was growing tired of the excesses of the ornate Baroque period and returning to classical or Neo-Palladian architecture. It was also the beginning of a building boom amongst the aristocracy and Whig politicians of the day. Campbell's work secured him many commissions and for a short time he served as a government advisor. Campbell was heavily influenced by the architect James Smith, whom he described in 'Vitruvius Britannicus' as the 'most experienced architect' in Scotland. However, it was Richard Boyle, the third Lord Burlington who would ensure Campbell's success. Once 'Vitruvius Britannicus' had brought Campbell to his attention, Burlington quickly employed the Scottish architect. He replaced James Gibbs as the architect of Burlington House, now the Royal Academy in London. And, in 1718, with Burlington's influential backing, Campbell was appointed deputy to the Surveyor General of the Royal Board of Works. Vitruvius Britannicus - His major published work, Vitruvius Britannicus, or the British Architect... appeared in three volumes between 1715 and 1725. (Further volumes using the successful title were assembled by Woolfe and Gandon, and published in 1767 and 1771.) Vitruvius Britannicus was the first architectural work to originate in England since John Shute's Elizabethan First Groundes. In the empirical vein, it was not a treatise but basically a catalogue of design, containing engravings of English buildings by Inigo Jones and Sir Christopher Wren, as well as Campbell himself and other prominent architects of the era.